Rocketdyne LOx/LH2 rocket engine. Developed 1965-1969. J-2 version proposed for Saturn follow-on vehicles, using results of the J-2X technology program. The engine was simplified while offering improved performance. Status: Developed 1965-1969. Date: 1967. Thrust: 1,138.50 kN (255,945 lbf). Unfuelled mass: 1,400 kg (3,000 lb). Specific impulse: 436 s. Burn time: 475 s. Height: 3.38 m (11.08 ft). Diameter: 2.01 m (6.60 ft). The J-2S also provided the basis for X-33 linear aerospike engine thirty years later. It was resurrected yet again in 2005 when NASA proposed it to power the trans-lunar injection stage of its Cargo Launch Vehicle. Finally, a further development of the engine was selected to power the second stage of the Ares I Crew Launch Vehicle for the Orion space capsule. The original J-2X program, conducted between 1964 and 1967, developed most of the simplification features of the J-2S, including the tap-off, and pump-fed engine cycle. 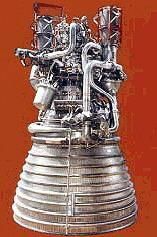 The J-2S (J-2 Simplified) engine was originally developed as a replacement for the J-2 Saturn vehicle upper stages, stages 2 and 3 on the Saturn V, and Stage 2 on the Saturn IB. The intent of the design changes was not only to provide performance upgrades to the engine but to greatly simplify the production and operation of the engine. The J-2S engine and components were developed between 1965 and 1972 and the effort was based on experimental engines tested between 1964 and 1968 (the J-2X engine series). The J-2S program consisted of six flight configuration engines tested at both sea level and vacuum conditions in 273 tests for a total operational experience of 30,858 seconds. At the completion of the program the engine was fully developed and ready to go into certification for flight operations. The nominal thrust, in vacuum, of the engine is 116,000 kgf with a specific impulse of 436 seconds, with a 40:1 nozzle expansion ratio. Baseline operation was at a mixture ratio of 5.5, oxidizer to fuel, with the capability to operate at mixture ratios of 5.0 and 4.5 on command for optimized propellant utilization during the mission. All engine interfaces were located such that the engine could be used as a direct substitute, in form, fit and function, for the J- 2. The version proposed by NASA in 2005 would have a specific impulse of 451.5 seconds and a thrust of 124,511 kgf (evidently with a greater expansion ratio nozzle). Throttling capability was added as an option for applications other than the Saturn program. The engine also included a low thrust operational feature known as Idle Mode. This was to be used for propellant tank settling, on-orbit maneuvering, and rapid engine chill down prior to firing. The J-2S simplification was primarily in the change from a gas generator engine cycle to simpler tap-off engine cycle. This cycle allowed for the elimination of the gas generator by supplying hot gas for the turbines from the combustion chamber, diluted considerably with liquid hydrogen. This simplification eliminated some of the timing difficulties associated with the start-up of multiple combustion devices. The oxidizer in this cycle was pumped to pressure and ducted into the injector. The fuel was pumped to pressure and used to cool the combustion chamber and immediately diluted with some of the cold hydrogen from the coolant circuit. This warm hydrogen and steam were used to power the high-pressure ratio turbines and were then ducted back to the nozzle at a suitable location to be expanded with the engine's exhaust plume. The engine start-up cycle was driven by a solid propellant gas generator, which was electronically initiated at the proper moment in the start sequence. These solid propellant turbine starters were arranged in a manifold of three units for those configurations requiring multiple starts. Each cartridge was fired in sequence and did not require protection from the ignition of the adjoining cartridges. The proper propellant utilization mixture ratio was controlled by a valve, which varied oxygen recirculation flow around the oxidizer pump. For lower mixture ratio, more oxidizer was recirculated. Idle mode was made possible by adding an injector, thus maintaining a stable pressure drop in each of these elements even during the low propellant flows seen during operation in this low thrust mode. Throttling was accomplished by closing down the hot gas valve, thus reducing the available power of the turbine. The effectiveness of this technique was verified by a hot-fire test. The J-2S, while not a qualified in-production engine, was not a paper engine. It was an engine with significant flight heritage in the J-2 Saturn program engine, and it had significant ground test experience. It was not put into production only because a follow-on order for Saturn launch vehicles never materialized. Because of the excellent flight history of its heritage system, and because of its "almost ready for flight" status, the J-2S was considered by NASA for a number of applications after its development. Detailed consideration was given during the Space Shuttle development for its use, as well as in the early stages of the NASA Advanced Launch System Program (ALS). It was estimated by ATK Thiokol in 2005 that restarting the J-2S program, including engine fabrication, design and reliability verification, certification, and production, would require four years. Although no J-2S tooling was known to exist, modern soft tooling could be developed quickly and less expensively than the original hard tooling. There was an existing manufacturing and supplier network in place to support a J-2S restart. In the event, NASA was unable to resist 'improving' the J-2S, and by early 2007 the engine for the second stage of the Ares 1 Crew Launch Vehicle was the redesignated and substantially different J-2X. Engine: 1,400 kg (3,000 lb). Chamber Pressure: 30.00 bar. Area Ratio: 40. Oxidizer to Fuel Ratio: 5.5. Coefficient of Thrust vacuum: 3.35409543547025. Restarts: 3. Country: USA. Propellants: Lox/LH2. Stages: Cargo LV Stage 2. Agency: Rocketdyne.